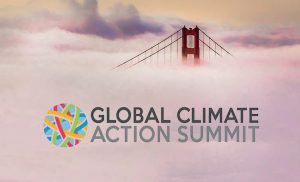 Note – CDFA and its secretary, Karen Ross, will be participants at next week’s Global Climate Action Summit, where a number of key sustainability issues across multiple sectors will be addressed. Part of the agency’s involvement is hosting partner events in connection with the Summit. CDFA is committed to helping farmers and ranchers adapt to climate change through a series of programs offered through its Office of Environmental Farming and Innovation (OEFI). In two years, nearly every government on Earth will convene under the auspices of the United Nations 26th Conference of Parties to consider two big questions: How well have we done against the climate change targets we set in Paris in 2015? And how much more must we do to minimize the effects of climate change? It’s difficult to answer those questions today, but it should be a bit easier next week after governors, mayors, CEOs, scientists and many more gather in San Francisco for the Global Climate Action Summit. There, all the constituencies that are not a party to the UN process—that is, those that don’t represent a national government—will take stock of their own actions to reduce carbon emissions and set new, more ambitious goals. The summit is organized around several themes, including land use and food production, in particular. There’s a direct connection between land use and climate change. When they’re healthy, forests, grasslands, and other landscapes pull carbon out of the air and sequester it in vegetation and soil. When habitats are cleared—most often to make way for agriculture, especially beef, soy and palm oil—they release the carbon they’ve stored back into the atmosphere. As the planet’s capacity to reabsorb carbon shrinks due to the loss of perennial habitats, emissions become even more concentrated. That’s why 2020 is such an important year. By then, members of the Consumer Goods Forum resolved to achieve zero-net deforestation for the main drivers of deforestation—cattle, soy, palm oil, and paper and pulp. Signatories to the New York Declaration on Forests also declared in 2014 that they will eliminate deforestation from the same commodity supply chains and halve overall deforestation by 2020. Agriculture must survive and thrive because we need food. But, we must reduce its impacts. Fortunately, we can, by producing more with less land and decreasing habitat conversion and other inputs in general. And we can begin by changing the way we produce livestock and feed. Historically, animal protein production has become far more efficient, driven by improved genetics of both animals and feed crops, improved diet and feeding systems, and better management practices and veterinary care, among other factors. Across the board, livestock producers have gotten more protein from fewer resources. Animals grow more quickly, produce more milk and eggs, use less feed and water, occupy less land, and emit fewer greenhouse gases. Of course, this has been a product of intensification, which comes with its own environmental impacts, such as greater concentration of waste with more significant impacts on water quality. Producers were driven to improve the quality of their products and to make more money by improving their overall efficiency, not to reduce environmental impacts per se. No one was monitoring the industry’s impacts and making sector-wide commitments to reduce them. Knowledge sharing happened at the local diner or feed store. With better metrics and monitoring, more open knowledge sharing, and greater financial incentives, producers can do even more to reduce the environmental impacts of livestock production. But today, producers lack a uniform set of metrics for key impacts or defined baselines. Without them, it is impossible to drive—much less document—improvements, prioritize interventions, set hard targets, and assess overall effectiveness. As a consequence, downstream players such as retailers and brands that want to encourage their suppliers to improve don’t know what to prioritize or where or how to hold suppliers accountable. Social media is driving change more than science and data. Going forward, we need to be more strategic and focus our limited resources on reducing the impacts that are most significant. And this is just with animal protein. Imagine if we want to improve all proteins. Which Proteins Have the Least Impact? Apples-to-apples comparisons of impacts across all proteins, from lamb to lentils, are even more difficult. But without them, we can’t make comparisons between proteins or reduce key impacts across species and geographies. And, without focusing on a key set of impacts, how can producers learn from each other about what works best to make production more sustainable? Standardizing metrics globally could do for sustainability what it did for food health and safety and global food trade. Performance and impact data should be shared within and across industries. With the stakes so high, supply chain partners and even competitors should weigh the trade value of the data against the mutual benefits of sustaining resource production and stabilizing the climate. Sharing data, working together and being more transparent about common goals and results can mitigate the reputational risks that one bad actor can create for an entire industry. The Global Salmon Initiative provides a good model: In 2013, CEOs of 17 of the world’s largest salmon farming companies (representing 70 percent of global production) recognized that they could improve environmental performance by working together and sharing information. Their 2020 goal is that 100 percent of their salmon will be certified by the Aquaculture Stewardship Council, which WWF helped establish. And, unlike most 2020 commitments, the group is 50 percent of the way there and has pulled most of the global salmon industry along with them. Finally, we need more innovative financial mechanisms and partnerships to facilitate investment, including long-term contracts and performance-linked interest rates, among others. Using these, entities such as banks, governments, and buyers can work together to give producers either the capital or the appropriate timeline they need to invest in better production. With access to markets and financial support, producers can afford to invest in new technologies and practices that can shrink the most significant portions of protein’s (e.g., animals and feed) environmental footprint. These include turning manure into energy, growing feed with fewer carbon emissions, reducing reliance on fossil fuel-based fertilizers, and eliminating the conversion of natural habitats from the Great Plains to the Amazon. At the Global Climate Action Summit in San Francisco from September 12-14, many companies will talk about what they are doing to conserve habitats and fight climate change through their supply chains. But, companies can only do so much—without consensus about the key impacts and metrics as well as the obstacles to improving performance, producers will not be able to build on their success to date. And, there is still a lot of progress left to make.